We've compiled our top news stories, magazine articles and YouTube hits for 2013. 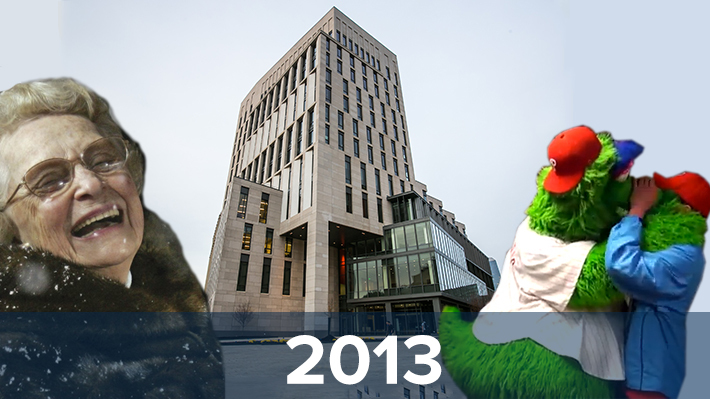 It’s official — 2013 will be remembered as the year Drexel LeBow came home. While Gerri C. LeBow Hall dominated our newsroom and pictures of a building on the rise made us proud on Facebook, it was our spectacular alumni who inspired all of us in the online edition of Market Street magazine. As we dig in for a 2014 of unprecedented growth, lets take a look back at the people and stories that caught our attention in 2013. OK. So we hadn’t heard of TopManagementDegrees.com either. That doesn’t mean we didn’t come together to toast to our new home being named alongside Harvard Business School and London’s Imperial College Business School as one of the most beautiful in business education. Cheers. It happened on Oct. 3. “The opening of Gerri C. LeBow Hall marks a major milestone for the University,” Drexel President John Fry proclaimed. “This new building will transform business education at Drexel and affirm LeBow College’s stature as one of the nation’s premier business schools.” Enough said. We finally freed our students to concentrate on majors. Apparently, they took notice, because the story went viral. This profile of Chicago Bears owner and proud Drexel alumna Virginia Halas McCaskey made it onto the Chicago Bears website, where it was received with open arms by ‘Da Bears’ devoted. We profiled local food legend Tom McCusker, owner of Honest Tom’s Taco Shop (located on 44th, between Spruce and Locust). He’s the reason why the corner of 33rd and Arch has been named “Philly’s Food Truck Mecca.” If you haven’t tried his tacos, we insist you make the trek over and treat yourself. She’s a fashionista. She’s an advocate for women in the workplace. She’s a very big deal. She’s Richelle Parham ’91, eBay’s vice president and chief marketing officer. And she was responsible for giving eBay a chic 21st century makeover. eBay loved our story so much they posted it for its employees. Featuring “Doin’ It, Right” by band-on-the-rise Cheers Elephant, this commercial announced our innovative C-Suite Co-op™, which gives our MBA students the chance to work for firms such as Cisco, SAP, eBay, Santa Clara VTA, Urban Outfitters and other leading American corporations. That’s doin’ it, right? Business Casual host Ryan Williams traveled to Citizen’s Bank Park to celebrate the Phillie Phanatic’s birthday and interview Tom Borgoyne ’88, the Phanatic’s (ahem) best friend. Hilarity ensued. This Homecoming Concert special edition of Business Casual took host Ryan Williams backstage before a live show featuring Porter Robinson, Waka Flocka Flame and Flosstradamus. When celebrities descend on Drexel, the hit counter sure does spike. Matheson Hall almost stayed put? Thirty miles of cable was installed in Gerri C. LeBow Hall? This story about all of the unknown steps that brought our building to life was a crowd pleaser. This profile of Bob Hall, the CEO and publisher of The Philadelphia Inquirer and Daily News, was full of revelations from The Inky boss. He won’t tweet and he won’t own a Facebook account. But he certainly embraced the digital age for his business. Engage with Drexel LeBow on YouTube, Facebook, Twitter and LinkedIn.